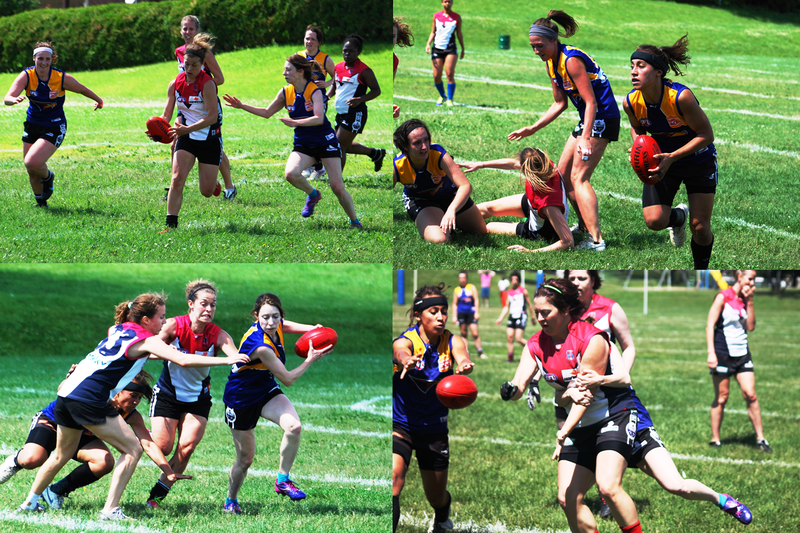 The NDG Devils have outlasted the Plateau Eagles to record the opening 4 premiership points of the 2014 Women's AFL Quebec Championship Season. Under blue skies at Parc Cluny, Laval, the future of women's footy in the belle province looked just as bright as both teams played out an enthralling match of football. The Devils set up the victory with 6 goals to 1 in the first half, eventually running out 41 point victors. 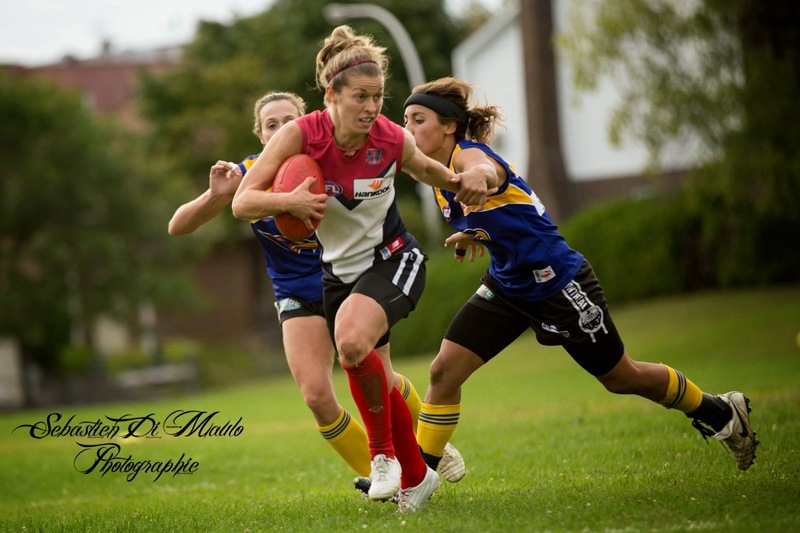 The women's schedule sees the flagship Montreal Angels head to Boston this coming weekend to take on the Lady Magpies and Lady Demons before returning home and preparing for Women's AFL Quebec at Parc Cluny, Laval on July 6th. Full Match report to come shortly. 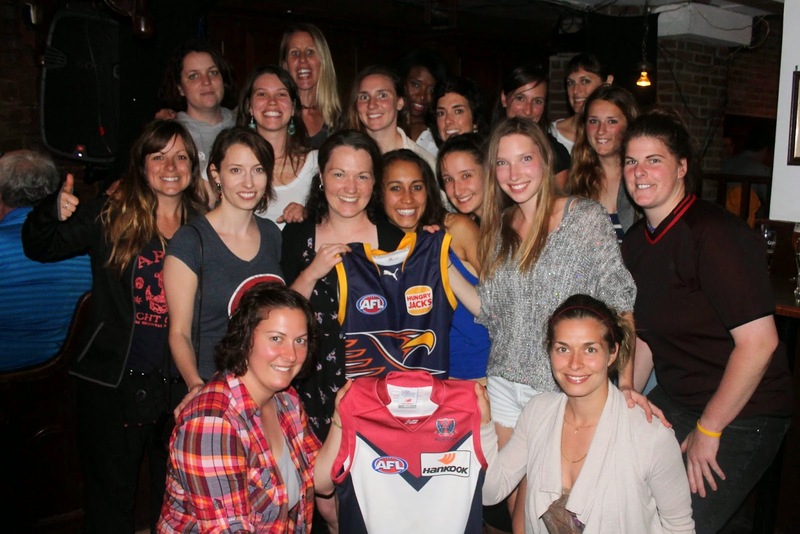 Wednesday the 11th of June played host to the inaugural AFL Quebec Women's draft where the abundance of female Aussie Rules talent in Montreal was formally registered into the two new domestic teams: the Plateau Eagles and the N.D.G Devils. Paul Fairbrother was revealed as head coach of the Eagles, the AFL Quebec icon bringing with him a huge resume of success in Quebec Australian Football. Dan Robinson took the helm of the Devils, his current success with the West Island Wooders men's squad a sure sign that women's footy is in great hands for season 2014. WOMEN'S FOOTY, FOR THE LOVE OF THE GAME! 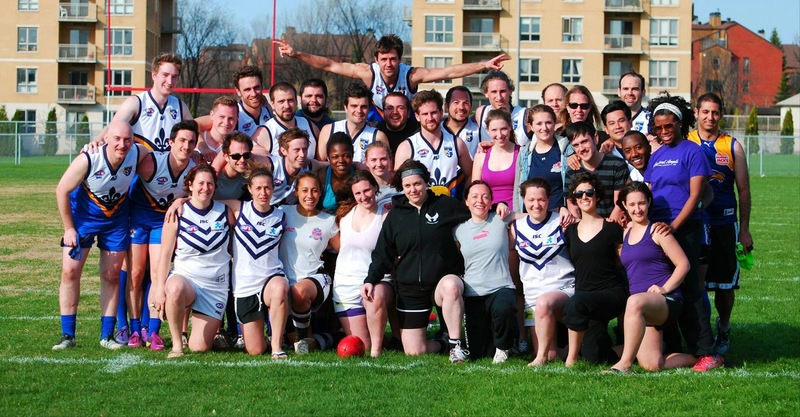 On the eve of the inaugural round of AFL Quebec's Women's league, one of our new members, Fabio Petosa, describes his impressions of the infamous Montreal Pre-Season Tournament. There appeared to be an incredible sense of excitement as the 2014 Women’s Tournament moved closer to the start. Against all odds the weather for the day had changed and instead of cloudy and rainy, the conditions turned to sunny and windy. Surely it was a sign for what was to follow. Participating in the tournament were teams from Boston, Ottawa, New York and the host, Montreal. As an outsider who was being allowed into the community of Australian Rules, I was amazed by the commitment level shown by the players. Many had driven for hours the night before and had arrived early to prepare for the tournament. I was asked if I would be willing to help out as a goal umpire and as a result I had the honour of playing a minor role in what truly was an epic display of skill, intensity, passion and unity. In sport, references are often made to key moments along a continuum. Whether it is over the course of a quarter, a half, a game, a season or a career; we look back at moments to provide perspective. We are therefore able to establish how we arrived to where we are, where we failed and where we succeeded. If one looked at the 2014 Women’s Tournament as a singular event they would consider it to be a success, but they would fail to realize the true sustainable impact the tournament will have on the growth of the game moving forward. As the tournament began it was obvious that the label of pre-season tournament was not really appropriate. The teams had come prepared for strong competition. No player was holding back as bodies crashed into one another and fell to the ground. Regardless of skill, the effort shown by each individual was at a level that I’m not certain I’ve ever seen for what was meant to be a warm-up tournament. I had the underlying sense that the four teams had come to the tournament committed to win and that each of them believed they could. Then something changed, at least from my perspective. Not in the quality, effort or intensity, but in the fundamental purpose of the tournament. I had been under the impression that the teams had all come with victory as their only goal, but then I started seeing something I had never seen at any tournament, for any sport. I was applauding a Boston player, but found that she looked a lot like a New York player. At first I figured it must be the sun playing tricks on me, but then I noticed another player. Then I saw Montreal players, people I personally knew and they were wearing Demons jerseys! It took me a moment to realize that they were filling out the squads whenever there was a shortage of players. Now I may be wrong about this, but in that instant I felt that winning the tournament was secondary. Victory was not the ultimate. Instead winning had been replaced by playing. In standing in to fill out rival squads, the players assured that all teams had an opportunity to field a competitive team. Perhaps I am generalizing and in no way do I want to take away from the intensity of the matchups, because regardless of the jersey, the effort level of the players did not change. However, to not focus on what I saw would be wrong. I saw purity of sport and it was beautiful. Simply playing the game and disregarding for whom, or to what end should always be celebrated – to battle to the end not for a team, but for the passion of the game. The desire to play took over the field that day and it left me inspired. There are very few greater compliments I feel capable of giving. I could list an endless amount of superlatives in describing the play, I could have written a piece laced with hollow clichés, score lines and stats, but instead I wanted to highlight the beauty of wanting to play. I can’t begin to guess the number of games, matches or tournaments I’ve been a part of and I have never seen such passion and unity amongst players for a sport. As I walked off the field that day I left with much more than just sunburn. I have become worn by the direction of organized sports and the bureaucracy, self-interest and corruption that surround leagues. What I saw on May 10th shot of hope. The organizers and volunteers did an incredible job throughout the weekend, but it will be the players and their spirit that I will always remember. 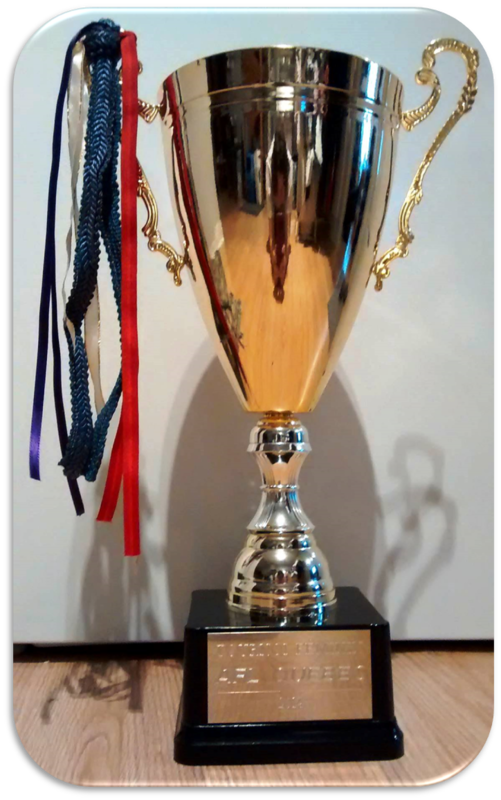 The Montreal Angels have kicked off their 2014 campaign with a hard fought victory in the 2014 AFL Quebec Preseason Cup claiming the silverware with five victories from five attempts. In one of the most closely contested cups in years, all four teams threw their hats in the ring as potential champions, the big news of the day the improved New York Lady Magpies who broke through for a first-time tournament victory. Full details and photos will be posted shortly. The Montreal Angels will host their annual Preseason Cup today at Collège André-Grasset in one of North America's premier Women's Australian Rules tournaments. Boasting teams from Boston, New York and defending champions Ottawa, the Angels will be fighting against some of the regions best female talent in their quest for a third title. The day will also include an AFL Quebec Rookie match and the province's marquee men's squad the Quebec Saints squaring off against the United States Division 1 team the Boston Demons. All the action takes place Saturday, May 10 at Collège André-Grasset, Boulevard Crémazie Est, Montreal from 9am. New players are always welcome regardless of prior knowledge of the sport or fitness levels! These practices are in addition to AFL Quebec Practice on Wednesday nights at Parc Jarry at 6.00pm.